This week the NF1 round summary starts with the match between the leaders Nantes-Rezé and Nice. We learned at the start of the week that Pauline God, a player in the second team of Nantes, died last week. So with the current situation at Nice, this match was played in a particular atmosphere. Nantes were without Morgan Cardin, whose foot injury has not healed. They did not waste much time to lead (20-9) by the end of the first period. Nice edged the second quarter to reduce their deficit by the interval (26-31). The hosts put the game out of the reach of Nice for good with a solid defensive third quarter (17-4) and went on to win the match comfortably (61-33). Nantes will be crowned as champions if they either win next week against Lyon or if Basket Landes loses against Pleyber-Christ. Dunkerque’s habit of beating teams in the top half of the tables continues. Last week they disposed of the leader Nantes. 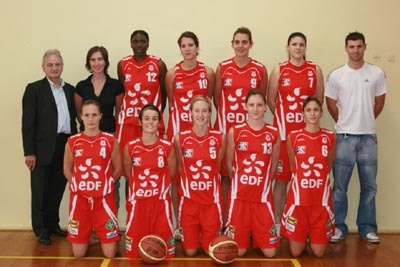 This weekend they beat Basket Landes (71-66). They once again had to come from behind at the start of the final period (54-56) to overcome their guests. Dunkerque’s home programme is over and now they have the difficult task of overcoming their phobia against teams in the lower quarter of the table. Abel Loucif will not be pleased with the way Racing Strasbourg fell apart in the last three minutes of their game against Armentières to lose (68-80). Strasbourg went into the final period leading by 6 points. But the team from the north managed to draw level around the 37th minute mark. Armentières then stepped on the turbo and hit their hosts 8-0 and the rest is history. Armentières remain in fifth place. Now they finish their programme with two games at home. Next week’s match against third placed Charleville could be decisive in their quest for a play-off spot. Charleville-Mézières cruised by Marseille (82-50) and remain in third place. Lyon have not mastered the art of winning close games and despite all their efforts they allowed their hosts, Limoges the victory (71-66). Lyon made up a 6-point deficit at the end of the third period (43-46) to level the match (64-64). Money-time was not kind to them as Marlyse Nogueira from Limoges made crucial steals and drew fouls. This allowed her - in what may be her last home game for the club - conclude the match in style. This defeat for Lyon put them in 15th place, one spot below Pleyber-Christ. Pleyber-Christ had no choice but to win their match against the CFBB in their contest with Lyon. Niagnoma Coulibaly dominated the match as she scored 23 points and took 27 rebounds to end up with a game ranking score of 39 points. The total ranking score from the CFBB was 39 points. Celine Lix hit 19 points as Pleyber-Christ won (69-50). For the CFBB Isabelle Strunc led the scoring with 19 points. Pleyber-Christ move above Lyon as they have the edge in their head to head contest with them and move up to 14th place. In the other matches, Voiron won on the road against La Roche (72-70), a victory that moves them clear of Lyon and almost guarantees NF1 basketball next season for them. Rennes had little trouble in beating Lot Garonne UST (82-69). The relegation situation in NF1 is as follows: Lot Garonne UST will not play in NF1 this season. No matter the final position at the end of the season they will be relegated. The new relegation zone starts in position 14. The merger of USVO and Saint Amand, which should be officially confirmed soon, should see the re-election of COB Calais back in the LFB. If this happens then the team that finishes 14th in NF1 will not be relagated. Other information, yet to be confirmed concerning NF1 status, is the financial situation of Mourenx and Racing Strasbourg, may also affect the relegation of the teams in 15th and 16th place.